To hear this sermon as preached, click the play button below. Newborn babies don’t know about gravity. Each of us, in our own way, has learned the hard lesson of just exactly how gravity works. You and I know not to sleep too close to the edge of the bed. But the newborn will happily roll over the edge and, before she knows what’s happening to her, she’ll find herself plunging face first to the floor. So, to protect our young children from this dramatic turn of events, we grown-ups design cradles with rails on them. The “cradle” then, is more than a mere piece of furniture where little people happen to sleep. 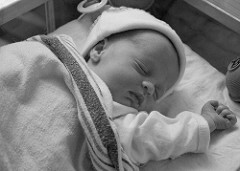 Built into this notion of “cradle” is the idea of protection. Experience intervenes, through the ingenuity of woodworking, to protect the innocent from a painful fall. Built into this notion of cradle, is the idea of love. When we love someone who is vulnerable, we endeavor to keep them safe. And to get an even more profoundly awareness of this idea of experience intervening to protect innocence, all we have to do is put the word “to” in front of the word “cradle” turning it from a noun, into a verb. To cradle someone, is to hold that person in your arms. To use your own body to protect the other person from harm. This idea is so deeply suggestive of our humanity, it almost makes me swoon. The verb “To cradle” contains within it all of the good intention of our love for one another. It is a perfect distillation of what it means to become a parent. To become a parent, is to reach a stage of being, as a human, in which one’s own survival shifts away from being one’s sole purpose. Now, your survival is less important than the survival of that being, cradled in your arms. As Christians we recognize this moment, don’t we? It is, believe it or not, a way to make this line of inquiry altogether more astonishing! The Bible … in particular the story that Deb just read for us this morning takes this idea – and takes it up about a million-fold! Imagine doing what old Simeon did! Simeon used your own body to protect God! Sweet old Simeon cradled God! There was a period of time, not quite ten years ago, when I worked as a personal care attendant. My job was to take care of a disabled man. He would not want me to tell you about him, so I won’t. I will just say that he was a little older than I, but not by much. As I cooked for him, we talked about things. We soon discovered that we’d grew up listening to the same music, and making the same kind of mischief. As I cleaned the place, he’d sit nearby. He’d point out the places I’d missed with the vacuum or the mop. He’s been home bound for almost a decade, but his intelligence was not to be contained – so he focused his nimble mind on getting the small details of his life perfectly tuned. The laundry detergent had to be put in at the right moment, while the water was filling the machine. The towels had to be folded just so… and put away just so. I did everything exactly in the way he wanted it done. I liked doing this, because I saw that my attention to his detail made him happy. He had several attendants, but he always scheduled me when he had a doctor’s appointment. He thought I was stronger than his other PCA’s and so I was better at getting him in and out of the car. But these events were stressful. He was the world’s worst backseat driver. It had snowed, and everywhere the winter had become drab from the graying influence of traffic – but here, suddenly, we found ourselves at the edge of a baseball diamond with the afternoon getting old and slanting in from the outfield. We parked beside the bleachers, part way down the third base line. No one was around. Because of the gull that flew over. He was concerned about the milk going bad. “Put it out in the snow” he said. I opened the door and placed the milk jug into the snow. We sat there, in the quiet, looking out at the empty ball field. “I used to play here when I was a kid,” he said. I have always remembered it, and tried to figure out why it meant so much to me – after all, on the surface it wasn’t all that momentus. And yet, there was something there. Amd when I think about, this morning, I am grateful for the idea of the Trinity. And that each personality is something that we can experience in our lives. God, of course, can be awesome and distant – the omnipotent creator who’s influence reaches across the distances of the universe. God can also be experienced as a spirit – as bird, flitting lightly into our lives. God also is a child, who we cradle in our arms, protecting her with our body. 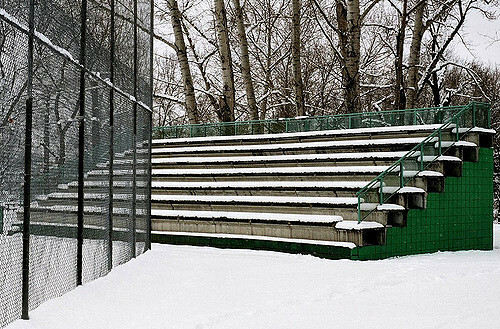 And this moment, with my friend at the snowy baseball diamond… this morning, I think of it like this – like Simeon, and the movement of the word “Cradle,” from noun to verb. For months, the two of us had been refining a kind of mutuality – a way of being together that was centered, completely and unabashedly, on the idea of care. That silent moment, parked next to the bleachers of his childhood, seemed a moment of absolute trust. Out under the open sky, with memory replacing fear. To be cradled, is to give oneself entirely to trust. To be the infant child, Jesus, is to give yourself over to a trust in all that is good.